OfficeMax, the American stationery chain, presents office decoration as the way to make life beautiful in this cinema advertisement from Escape Pod and Brand New School. In a world, filled with enchantment, only one woman and a rubber band ball can bring life to an office devoid of color. Eve. Life is Beautiful. Work Can Be Too. The Life is Beautiful campaign was developed at boutique agency The Escape Pod, Chicago. 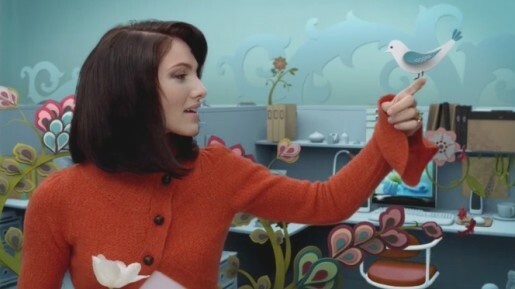 Production and post production were done at Brand New School, Los Angeles, by director Ben Go, director of photography Jeff Cronenweth, executive producer Jennifer Sofio, Flame artist Ryan Yoshimoto, editor Eric Barnes, compositors Kyu Kim and Mark Kim, CG supervisor Stephen Sloan, 3D artists Max Keane, Franz Vital, Robin Kim, Sam Sparks, Vinh Chung, Christina Lee, Paul Nelsson, John Sadler, Rotoscoping artist Pablo Wang, designers George Fuentes, Sharon Marcussen, Andy Bernet, Wakako Ichinose, Robert Bisi, Kyu Kim, Tim Koh, Brian Gossett, live action producer Annie Johnson, post production producers Darren Jaffe and Brighid Diers. Music is “At the Edge of The Ocean” by New York City band Ivy. Music search was performed by Comma Music, Chicago.